Welcome To The Wonder Woman Museum! 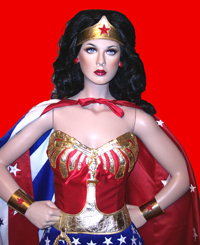 Wonder Woman '77 Meets The Bionic Woman Exhibit Added!
. : Top 10 Other WW Sites :.
.: Wonder Dates Of Note :. April 30: Cloris Leachman, television's "Queen Mother" in ABC's The New Original Wonder Woman pilot, was born in Des Moines, Iowa. May 2: (1954) William Moulton Marston, creator of Wonder Woman, dies in Rye, New York at the age of 53. May 6: (1983) Adrianne Palicki, the star of NBC's 2011 Wonder Woman pilot, was born in Toledo, Ohio. May 7: (2002) Robert Kanigher, past editor and writer of Wonder Woman comics (vol. I), died May 7, 2002. May 8: (1944) The Wonder Woman comic strip begins in newspapers in the United States and Canada, written by William Moulton Marston and drawn by H.G. Peter. It was syndicated Monday-Saturday by King Features Syndicate. May 9: (1893) William Moulton Marston, creator of Wonder Woman, born in Cliftondale, Massachusetts. May 16: (1944) B.J. Ward (aka Betty Jean Ward), the fourth voice actress to portray Wonder Woman -- on Super Friends: The Legendary Super Powers Show and the 1988 series Superman -- is born in Wilmington, Delaware. May 16: (1955) Mary Debra Winger, television's only live-action Wonder Girl, was born in Cleveland Heights, Ohio. May 18: Listed as the birthday of Queen Hippolyta (in the 13th century BC) as per Wonder Woman #131 (May 1962). See also January 8th. May 19: (1966) Jodi Lynn Picoult, past writer of Wonder Woman comics (vol. III), is born May 19, 1966 in Nesconset, Long Island, NY. This virtual museum is an ongoing project dedicated to presenting information on the past, present, and future of the world's most famous super-heroine. On the following pages, you'll find Wonder Woman represented not just in the pages of comic books and on television screens, but also in thousands of pieces of memorabilia. Wherever possible, this site will give behind-the-scenes information, artwork, or interviews detailing how various projects were created. The museum is curated by best-selling author and comic book writer Andy Mangels, who has been collecting Wonder Woman memorabilia since the 1970s. Mangels is the author of the best-selling Wonder Woman '77 Meets The Bionic Woman comic series (2016-2017), and his nonfiction writing has included interviews, profiles, and articles of many of those who have been part of creating the Wonder Woman mythos. He has also been interviewed in numerous Wonder Woman documentaries, and organized the annual Wonder Woman Day and Women of Wonder Day events, raising over $135,000 for Domestic Violence charitable programs. Releasing in May 2017 from La-La Land Records is the 3-CD Limited Edition Wonder Woman Original Television Soundtrack! Long requested by fans, this set will result in many, many spins... both in CD players and of fans themselves! Television's most iconic super-heroines finally meet in this six-issue mini-series, written by Andy Mangels, with art by Judit Tondora, and colors by Roland Pilcz! Published in 2016-2017 from Dynamite Entertainment and DC Comics, the series has proven a huge hit with both fans and reviewers, and has been a consistent strong seller! One of the most common questions we get here at Wonder Woman Museum is "What Wonder Woman books can I read to or get for my children?" Click the image below for a special exhibit of books that Younger Readers -- and Older Readers -- will love! The first live-action Wonder Woman project seen on TV was the 1974 Cathy Lee Crosby telefilm, on ABC in 1974. Newly-released from Warner Archives, you can order it by clicking the image below! The five annual Wonder Woman Day events from 2006-2010 raised over $110,000 in Portland, OR and Flemington, NJ for Domestic Violence programs, selling over 1,000 original pieces of Wonder Woman artwork and garnering four Mayoral Proclamations! Under its new name, WOMEN OF WONDER DAY, the HEROIC event returned in 2011 and 2012, raising an additional $25,000 for Domestic Violence programs! You can learn more about WOMEN OF WONDER DAY in the near future, but after a server crash, the website needs to be rebuilt. An exact replica of Lynda Carter's CBS-era costume created from patterns from an original costume, and showcased on a custom-made mannequin! 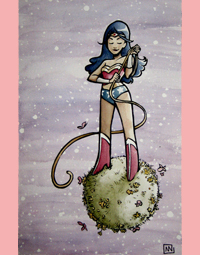 A beautiful image auctioned for charity at Wonder Woman Day 5 in 2010! See WONDER WOMAN DAY 5! 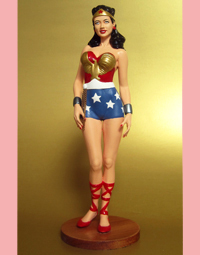 A gorgeous custom statue auctioned for charity at Wonder Woman Day 5 in 2010! 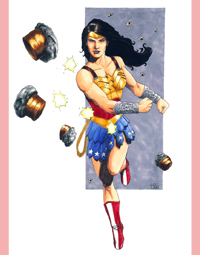 Bullets and bracelets fly in this image auctioned for charity at Wonder Woman Day 4 in 2009! See WONDER WOMAN DAY 4! 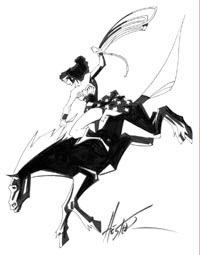 A heroine for the Earth is showcased in this image auctioned for charity at Wonder Woman Day 4 in 2009! 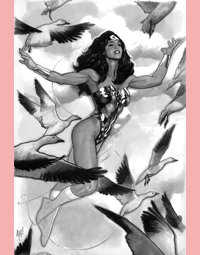 An Amazon takes to the skies in this image auctioned for charity at Wonder Woman Day 3 in 2008! See Wonder Woman Day 3! 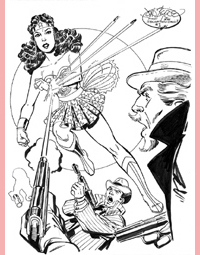 An homage to the cover of Sensation Comics #1, auctioned for charity at Wonder Woman Day 2 in 2007! See Wonder Woman Day 2! 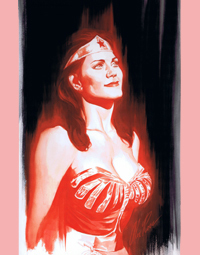 An homage to the cover of Wonder Woman #1, auctioned for charity at Wonder Woman Day 1 in 2006! See Wonder Woman Day 1! DISCLAIMER: "WONDER WOMAN" and all related names, characters, and elements are trademark and copyright 1942-2015 by DC Comics.